March is upon us. It seems the weather can’t seem to make up its mind. One day it is blustery and cold and the next it feels like spring. Changing from one season to another seems to be difficult even for mother nature and for we human beings, seasons of change and transition can be even more challenging. But not to fret. Just as the blossoms of spring are sure to bloom, so too, we will blossom and bloom when the time is right. Ever feel like God is calling you to something new but you don’t know what? Perhaps you’ve lost your passion for things that used to motivate you or don’t know what season you are in right now, but I can tell you this. When things get uncomfortable and stuff starts happening, you can be sure something is up, but it is not the time to throw in the towel. 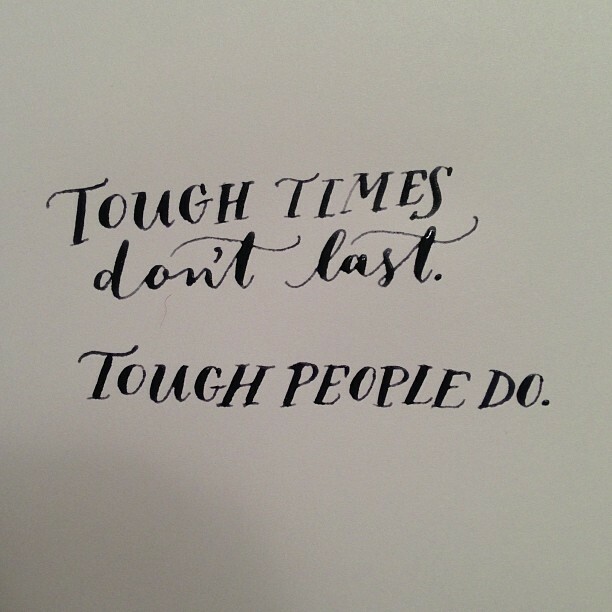 Someone said to me recently “You are used to toughing things out” and I realized that is true. I have been. As a single parent, working a demanding career, and not having family support around, it has been quite tough. But there are times in life when we need to tough it out, regardless of what others think or say. What really only matters is what God thinks and says. What matters is doing the right thing no matter how hard or inconvenient it may be. So let’s put this into more practical terms. Are you in a difficult marriage or relationship? Tough it out. Are you struggling with health issues, financial issues, or house problems? Tough it out. Are your kids doing the wrong thing even though you’ve taught them otherwise? Tough it out. Too many times we throw in the towel because the going gets rough. Too many people get a divorce, quit their job, or disown their kids because things aren’t going the way they would like them to go. Guess what? That’s life. Life is not always a bed of roses. Things don’t always go according to our plans and schedules. Sometimes people make poor choices that affect us. As a friend used to tell me, “It is what it is.” So, what to do in these seasons of challenge when the whirlwinds swirl all around us? Two words. Have faith. As I say in my book, faith is the power behind the promises, the fuel that fires up our engine. We all have it to some degree because it is a gift from God. The question is are we going to activate it? There are things we can do to strengthen our spiritual muscle to get thru the tough seasons of life. For more, check out my newly revised edition on Amazon.com or your favorite online retailer and in the meantime, keep looking up!